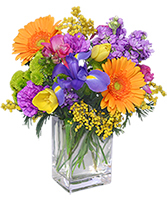 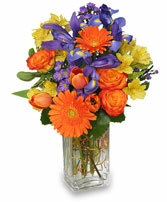 FTD® Sweetest Blooms Bouquet explodes onto the scene with colour and vibrant energy, perfect for celebrating Mother's Day. 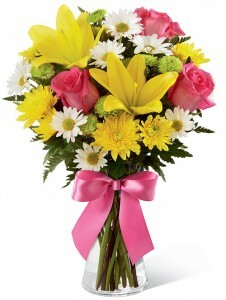 Beautiful fuchsia roses and yellow Asiatic Lilies pop against a bright backdrop of yellow mums, white daisies, button poms and fresh greens. 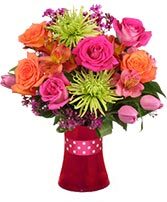 Arranged in a classic clear glass vase and accented with a satin hot pink ribbon, this bouquet is a breath of fresh air.